culture / Local Love / Out and About / sacramento / Things to do / Things to do Around Town. / Words. Ready for Halloween? Well, the horror comes a little early this year with the return of Sinister Creature Con! The convention, which is in its second year, is all about movie effects and horror. It features guests including Lori Petty (Orange Is The New Black, Gotham), Katherine Isabelle (Hannibal, Freddy vs Jason, Ginger Snaps), and renowned make up artists from the Syfy show Face Off. Con-goers will be able to see live make-up, sculpting, and painting demos and even learn to create these effects themselves in workshops given by experienced and award-winning make-up artists and fabricators. 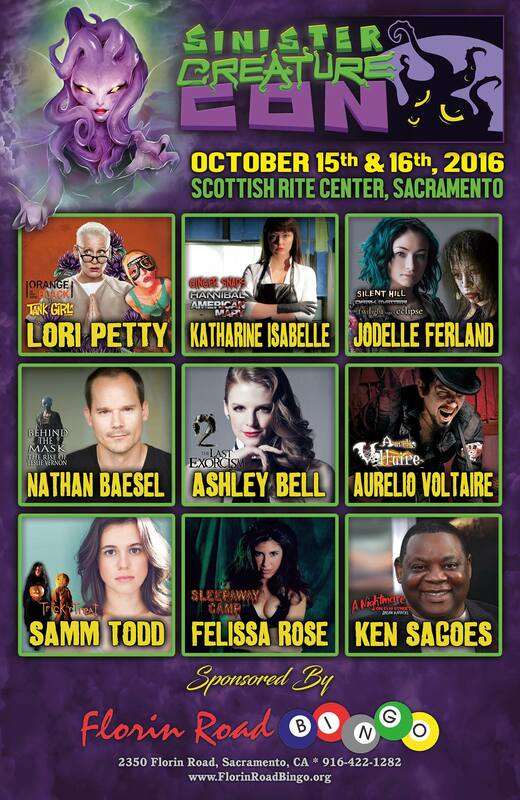 There will performances by Aurelio Voltaire, Rich Uncle Bill and the Daleys (Bill “Stay Puft” Brian’s band), short films from Sac Horror Film Fest and CryptTV, an ‘insane’ puppet show Shadow Circus Theatre, and much more. Sinister Creature Con runs from October 15th-16th at the Scottish Rite Center, 6151 H St, Sacramento. A weekend pass is $25 and a Gold VIP Limited Edition pass is $65. Get your tickets and more information at your own risk here. Tags: Ashley Bell, Aurelio Voltaire, Bill "Stay Puft" Brian, CryptTV, Face Off, Freddy vs Jason, Ginger Snaps, Gotham, Halloween, Hannibal, Horror, Jodelle Ferland, K. Hules, Katherine Isabelle, Katta Hules, Lori Petty, make-up, Nathan Baesel, Orange Is The New Black, painting, practical effects, Rich Uncle Bill and the Daleys, Sac Horror Film Fest, Sacramento, Scottish Rite Center, sculpting, Shadow Circus Theatre, Sinister Creature Con, special effects, Syfy, TUBE. Magazine. Bookmark the permalink. Previous post ← SunMonks Release New Single.